Brevard Tomorrow announces its annual Community Celebration, an event that highlights the organization’s accomplishments and honors its many volunteer team members and partners. The date is Thursday, August 25, 2005, from 8:30 am to 10:30 am, at the King Center for the Performing Arts Rotunda, in Melbourne. Originally scheduled for June 17, Brevard Tomorrow recognized the equally important Community Leaders Breakfast -sponsored by NASA and being held on the same day- could compromise the attendance for both events, as they each invite a majority of local business and community leaders. “Our community is rich with opportunities to connect with our fellow leaders and visionaries,” said Leadership Brevard President/CEO, Kristin Bakke. “Sometime equally important events end up scheduled for the same day and time. Out of respect for NASA and recognizing that this event has a long history of bringing Brevard County together for a look at our future, we feel that it’s right to give this event the spotlight,” Bakke said. 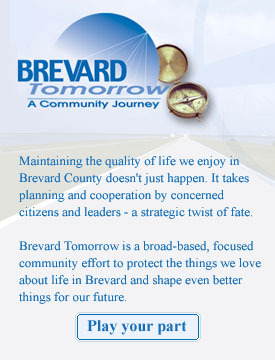 A community initiative launched in 2001, Brevard Tomorrow -a program of Leadership Brevard, Inc.- is comprised of a collaborative team of individuals, businesses, community organizations, and county and municipal governments that work closely together to address issue areas deemed critical for maintaining and enhancing the superior quality of life that Brevard County residents expect, including civic infrastructure, the economy, education and workforce, governance, and land use and growth. The event showcases the many accomplishments and milestones the organization has reached and outlines the goals and scope of work planned for the coming year. Keynote speaker for the event will be Rebecca Ryan of Next Generation Consulting who will present Hot Jobs-Cool Communities: Attracting talent and the companies that follow it. Attracting and retaining young professionals is recognized as one of the key elements to Brevard’s future economic success. The public is invited, however seating is limited and reservations are required. For more information, or to make a reservation, please call Brevard Tomorrow at 321-632-8222 or email brevardtomorrow@leadershipbrevard.org.